37th Dally In The Alley Is This Saturday! Tonight! Detroit Passport To The Arts Season 6 Launch Party! and the Great Lakes Chamber Music Festival. Join DP2A on the third floor of Bookies for an evening of mixing and mingling to celebrate the 2014 - 15 Passport Season! Enjoy this free event with complimentary appetizers, cash bar, and details about upcoming DP2A events. Special thanks to Bookies Bar & Grille for sponsoring the Launch Party. Passports for the 2014-15 season are selling quickly! over half have already been sold. 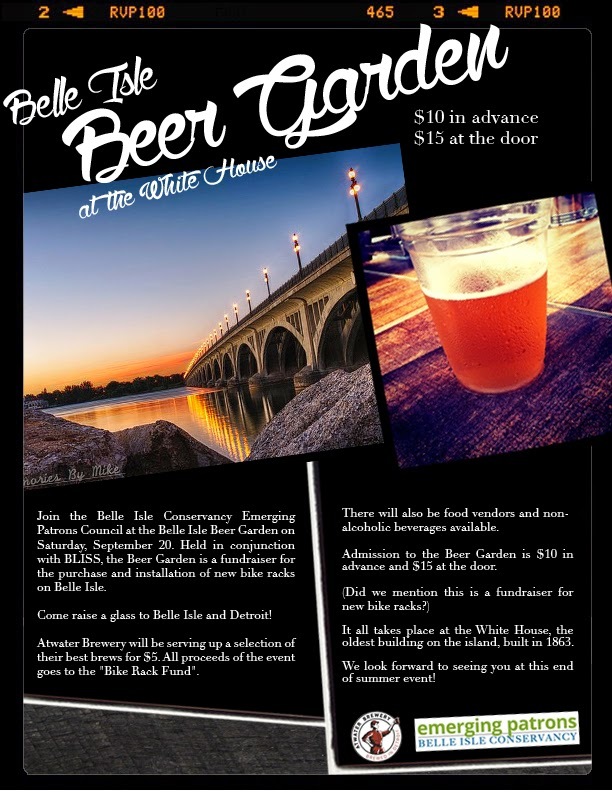 Get Your Tickets NOW For The Belle Isle Beer Garden, September 20th! PS This is a fundraiser to well equip Belle Isle with bike racks! Guess Who Made National Geographic's "2014 Traveler 50: World's Smartest Cities"
In China, rotating pods atop Guangzhou's Canton Tower overlook one of the world's most populous cities. Except from "The 2014 Traveler 50: World's Smartest Cities"
The Dally in the Alley festival celebrates its 37th anniversary Saturday, September 6, 2014. Held in Detroit’s storied Cass Corridor, the annual event attracts thousands of attendees to the live music, DJs, art, vendors, food, reunions with old friends, and the making new friends, too. The festival-goers, a colorful and diverse cross-section of Detroiters, experience a unique party that has become one of the most-loved festivals in Detroit. Since it began as an inner city art fair in 1977, the Dally has evolved into a culturally significant affair. In 1982, the fair moved a few blocks to the alley between Forest Avenue & Hancock, Third and Second and evolved into a performing arts festival. While in recent years the celebration has expanded in both size and attendance, the Dally in the Alley remains a one-day festival that is not to be missed. Four music stages, a community stage, kids fair, art installations, more than 150 local food and retail vendors provide attendees with activities and entertainment all day long. The festival, a fundraiser for the North Cass Community Union, prides itself in staying true to its core mission of celebrating the area that it takes place in. In 2013 in a poll among MetroMix readers, Dally in the Alley was awarded with the honor of “Best Festival in Detroit”. In 2014 the festival was named “Best Summer Festival in Detroit” by Metro Times staff. ● Dally In The Alley Installation Project: Continuing the tradition of showcasing cutting edge art, Dally Art Director Andy Durkas has put together an exciting presentation featuring art installations by local artists, including sculpture artist Thomas Pyrzewski. Pyrzewski will be doing a special live build amidst festivalgoers throughout the day. Installations also include community-curated art and will be in various locations throughout the festival. ● More local goods than ever before: We’re excited to announce the growing interest from local businesses to bring a wide variety of goods to showcase at Dally in the Alley. Vendors include: Common Threads Clothing, Human Detroit, Slows BBQ, Jacques Tacos, Respect Detroit apparel, among many others. There will be over 160 vendors will be in attendance in 2014, a new record for the festival. ● Ann Kennedy Community Stage & Fashion Show: Dedicated to long-time supporters Ann Kennedy and Dylan Bailey, Dally in the Alley’s fifth stage is an eclectic interactive performance space that pays homage to Dally's community roots. It will feature soapbox forums, performances, contests and other activities. A fashion show is also planned for 7pm at the Ann Kennedy community stage; the show will feature runway models and clothing from local retailers that can be found for sale around the festival. For the first time ever Dally and Pop-Up Yoga Detroit will also be hosting Yoga and Crossfit workouts throughout the afternoon. ● Continued Focus on Environmental Impact: The North Cass Community Union is working with Recycle Here to make the Dally in the Alley the greenest festival in Detroit. By requiring all food and drink to be served in compostable wares and staffing volunteers to ensure the right waste gets into the right can, Dally has reduced the amount of garbage by over 60 yards. This year, Dally will bring in over 150 new trash receptacles to be placed inside the alleyway to keep the Corridor Cass clean and kept up. ● Poster Artist: Ron Zakrin. This year’s poster art comes from redounded Detroit artist, Ron Zakrin. Ron Zakrin has been an ever-present creative force in Detroit since the mid nineties, when he emerged on to the underground electronic music set with paintings that provided a visual counterpart to the Detroit sound that was taking the world by storm. Zakrin lives in Detroit Michigan, where he was born and works daily. Dally in the Alley takes place in Detroit's North Cass neighborhood, between Forest and Hancock, Second and Third on Saturday, September 6, 2014 (rain date is Sunday, September 7, 2014).